People having a mental health crisis who are held by West Mercia Police could now be taken to a "safe space" instead of a cell. New laws are now in force which limit the time people suffering mental health problems can spend in custody. An NHS trust says a "safe space" area at Newtown Hospital, Worcester, means officers can be stood down. The force dealt with more than 5,000 mental health cases in 2017. Its PCC says demand on police "can be reduced". West Mercia Police said it was constantly reviewing its own policies. 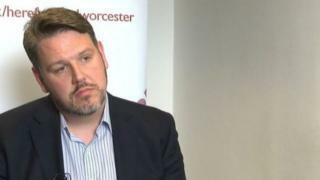 Gary Morgan, a spokesman for Worcester Health and Care NHS Trust, which runs mental health services in Worcestershire, says the new safe space will have trained mental health experts who can assess patients quickly and plan future care. It will be a "designated place of safety" for any person detained by police in the county when suffering from a mental disorder. From 1 January to 27 October this year, officers across Shropshire, Herefordshire and Worcestershire were called out 5,439 times to mental health incidents. West Mercia Police and Crime Commissioner (PCC) John Campion said officers needed to be able to use their time "keeping communities safe". Mr Campion said: "There is a natural link between crime and mental health as it can either make people more vulnerable to crime, or may be an underlying cause for offending. "That link cannot be eliminated entirely, but I am certain that current levels of demand can be reduced. "Ensuring that people suffering with mental health issues get the right support is vital. "Our police are not mental health professionals and we cannot expect them to be, particularly when demands on their time are increasing."